Since the dawn of the railways there have been enthusiasts devoted to the subject, and today the collection go railway memorabilia is a very popular hobby. 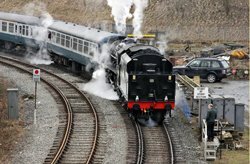 As rail travel has developed across the years – the passenger railway is almost two hundred years in existence – so the interest in the history of the networks, locomotives and other aspects of rail travel has increased. It is fair to say that most collectors of such memorabilia concentrate their efforts on the ‘golden age’ of steam locomotives, with the first half of the 20th century presenting some of the most interesting items for collection. It is also interesting to note that many artefacts are very affordable. For the enthusiast the most collectable of all railwayana – as it is becoming known – is anything associated with locomotives, particularly steam locomotives. The tradition of naming engines was – and still is – commonplace. For this reason, locomotive nameplates are at the top of any list of collectable railway items. It is interesting to note that when locomotives were scrapped, as happened when they reached the end of their working life, nameplates tended to be spared. This was particularly so in the 1950’s and 1960’s when steam locomotives began to be replaced by modern diesel engines. There are many nameplates in existence, and those lucky enough to have got their hands on one back then may now have a valuable item in their possession. The more expensive nameplates can fetch tens of thousands of pounds. Where an engine was not named it will still have had a number. The number will have been in the form of a metal plate attached to the engine. These numbers are also very collectable, and are less expensive than nameplates. The next most popular items after those relating to the locomotives are station nameplates. As the railways have become streamlined and many smaller branch lines were closed so the stations became defunct. The familiar nameplates survive in many cases, and are sought after by collectors who want a slice of railway history of their own. They are attractive signs, designed in a modern fashion of the time, and can fetch anywhere from a few hundred pounds to several thousand pounds apiece. Anything to do with signal boxes - once a familiar trackside sight – is also sought after, from the signs on the outside to the machinery inside. Likewise, old waiting room signs are also a popular purchase by railway memorabilia collectors. Among the less expensive items for collectors are old timetables and other ephemera, but it is worth noting that railway advertising memorabilia is selling for record prices. Posters that once appeared in their thousands in stations, often advertising rail journeys to popular seaside towns, are scarce now and can fetch thousands of pounds at auction. With the growth in popularity of railway collecting there are now some specialist auctions – online and otherwise – where enthusiasts can indulge in their passion for railwayana. These auction houses feature regular sales of a wide range of memorabilia, and are excellent places for the dedicated enthusiast to add to their collections. Being specialist auctions, however, they do tend to feature the higher priced items. It is always worth keeping an eye on the likes of eBay, where there are usually many railway items on sale. The more enthusiastic collector might wish to visit scrap yards in search of long-forgotten items from years ago, and by enlisting on enthusiasts forums online information about where to look can be found. Word of mouth is sometimes the best way of getting hold of good quality railway memorabilia, and you never know when you might find someone who has something in their shed or garage that they don’t want! Return to Home Page from "Railway Memorabilia"